I was sent one of the new Rapesco hole punches to try and show to you guys. 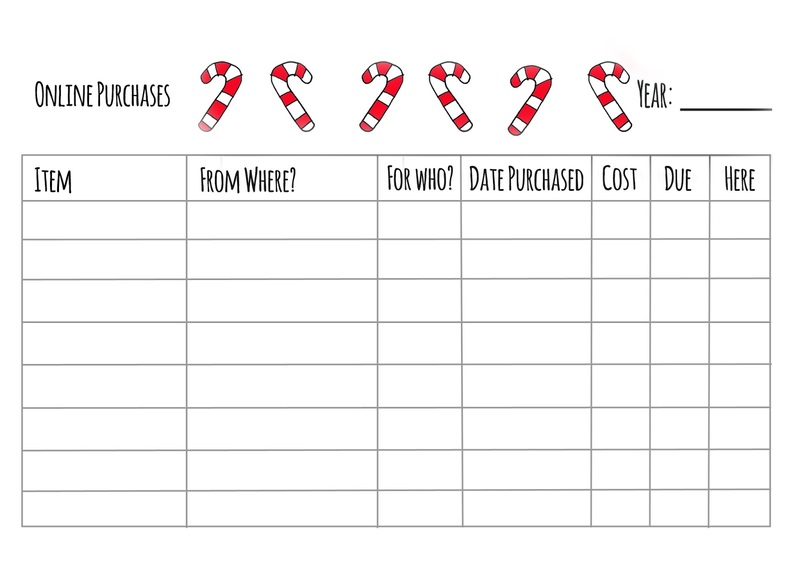 This new punch, punches all 6 ring ring planners and all sizes! This particular punch is available here: http://rapesco.com/products/adjustable-6-hole-organiser-diary-punch-white/ but other colours and products are also available. Your email address will also be passed to Rapesco and they may add you to their email newsletter database. I have a confession to make...I am having commitment issues with my planner! I have for a while now. I bought my "unicorn" and still, I find, I cannot commit. Planner peace is elusive. It is for me anyway. I'm always looking for new and fresh ideas which don't tend to suit planning. Unless it's creative planning, but then I'm more the creative as opposed to the planner! I believe it's all down to me being more right brain! I rarely enter the territory of left brain!!! I'm also no longer a lover of ring bound anything! I'm a TN (Travelers Notebook) girl all the way! I have, therefore, shelved all my planners, pulled out my TN's, and printed off a small planner without the intimidation of huge amounts of space to fill. Next I covered it using one of the sheets of paper from this months Brimbles box. I then printed off October's planner and used ephemera from the box to decorate it. You really do have to use, not what you think looks good, but what works for you. There are so many different planners out there, but at the end of the day, when it comes to planning, it has to be practical or you won't use it! The one I have is small. It may not be right for me in months/years to come but it fits my lifestyle now. 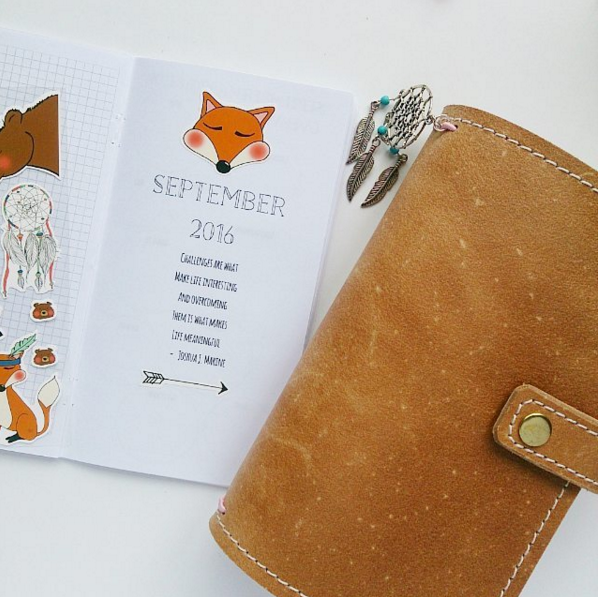 I used the gorgeous stickers from Anna's box to decorate it giving it a very Autumnal feel. By the way, these are her own pieces of art! In my next post I will show you how I have used the stickers and stamps for my TN journals. Check out my Instagram for regular posts https://www.instagram.com/geraldinejayne/ and my YouTube channel to see the unboxing for this months box. Planner insert is from Paws Plan Create on Etsy. 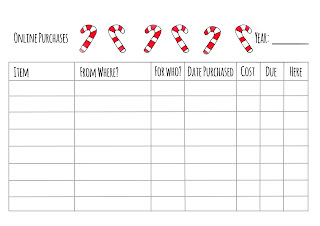 Every year I do like to do a planning for Christmas series. Now some of you are probably flinching already as it is only September and I mentioned the C word. I am not going to apologise for that because Christmas is my thing and I love to plan for it. This year I am not going to run a 'formal' series but more of a vloggy style look into what we are up to in the Brim household as we plan for Christmas. If you would like to see the series that I did previously with lots of free inserts for you to print and use at home just click here! I have a free insert for this week. Just click on the image below to open it 'big', right click and save! 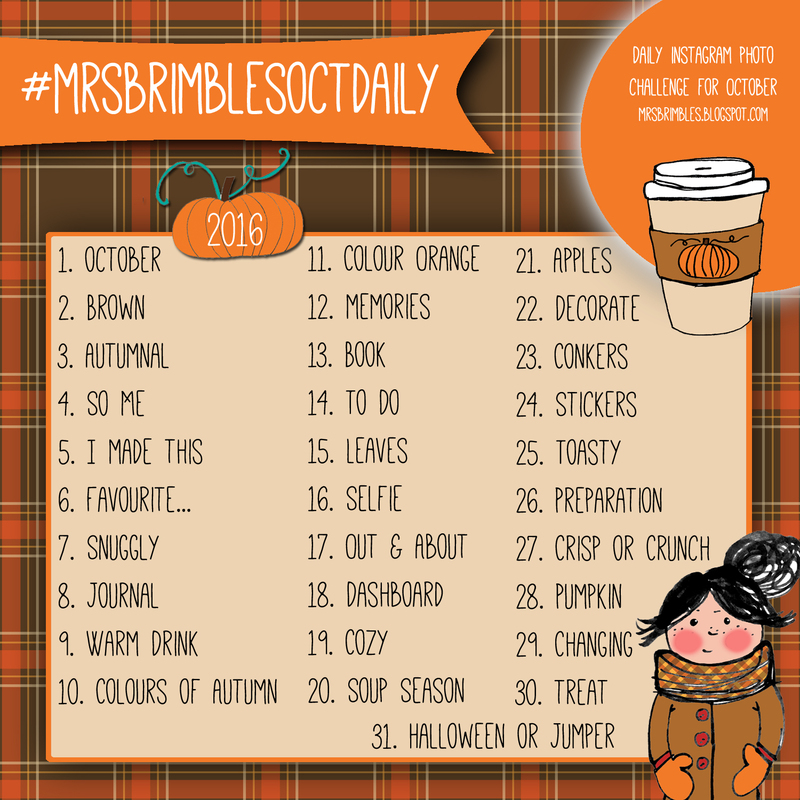 October Instagram Challenge is back for 2016! October Instagram Challenge is back! You guys have asked if I will be doing another instagram challenege for October. Errrrr yeah! It is totally and utterly my favourite time of year so of course, I can't wait! I love seeing all of your photos especially the seasonal ones! REMEMBER as with all of my daily photo challenges I have designed the prompts to be interpreted in a way that suits you, loosely based on the things that I love: Planners (and planner decoration), Stationery, Journals, Books, food, the season etc. You interpret them however you like but most importantly have fun with it. They are just prompts to help you. Take them literally if you like or be imaginative. For example 'Book' could be a book you are reading or it could be something that you need to book. 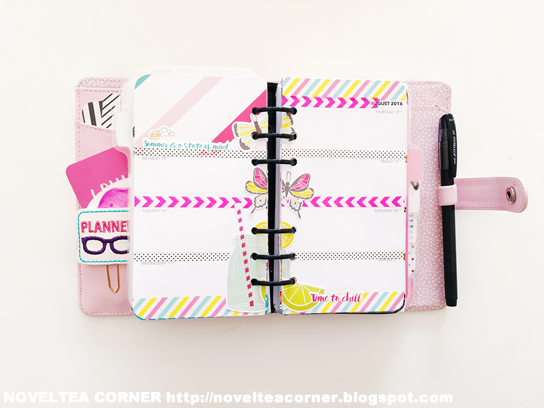 Share your life or share your planner or journal. Use them as photo prompts or use them as journalling prompts. Anything goes! It's totally for fun so just share a photo every day. You don't have to enter to win the prize, you can just play along with the prompts for fun, entirely up to you, the more the merrier! You must post all 31 photos on instagram using #mrsbrimblesOCTdaily you may also want to use #mrsbrimblesOCTdaily2016 (although not compulsory) as the challenge is now in it's 3rd year! You need to be following me on instagram: @mrsbrimbles please do not tag me in your photos as I will get lots of notifications. I will see your photos on the hashtag! The prompts are just that, prompts, interpret them as you will, or if you are stuck for inspiration just post a photo anyway! If it is easier you can do a different prompt on that day as long as by the end of the challenge you have done all 31. Do two on one day if you need to, don't worry about missing days as long as you post all 31. Have a break, come back again. You just need to post 31 photos in the time frame given. You have until 7am GMT on 5th November 2016 to register for the giveaway on the widget below AND to complete the photo challenge on instagram. If you haven't registered on the widget you won't be elligible to win the prize so you will just be doing the challenge for fun which is totally fine with me if it is with you.You can register at any time from now but photo posting on instagram starts on 1st October 2016. You DO NOT have to post everyday but you do have to post all 31 photos by 7am GMT on 5th November 2016. You DO NOT have to post in numerical order, you can post any prompt on any day and any number of photos on any day. Once the competition has closed a winner will be drawn by random using the giveaway widget, and emailed. I will ask you to confirm / prove that you have posted all 31 photos in the time frame 1st October - 5th November 2016, if not another winner will be chosen. The winners name will appear on the giveaway widget once closed. For my final layout in September this year, I couldn't go past using the gorgeous items included in the August Brimbles Box (check out my unboxing here). The gorgeous pinks and blues and yellows in this box absolutely say "Spring" to me - plus there's cups of tea and I've been drinking tea non-stop over the last few months. I also really love the little motivational messages that Anna includes on her sticker sheets, because it's important to see those little messages daily. As much as I like to think that I'm pretty good at maintaining a peaceful existence amongst the crazy daily-jobs that need to be done, sometimes I just need to see it written down and allow myself a moment to re-center myself and keep on going. The little ephemera packs that Anna includes are great for all sorts of things.I've used them for Project Life, cut them out and used them as ephemera, but this time I really wanted to use this little business-card sized piece as a title for my page. While my inserts have a section for notes, I rarely use it for that - I like to have a 'title' or central focus for my decorative layouts to help tie everything else together, and this card fit the bill this week. I like to think that I have the same expression as the gorgeous little tea girl when I drink my tea! And that is my finished layout. I will include my process video down below in case you would like to see how this layout came together and in which order things were laid down. I hope that wherever you are in the world, you've having an amazing week - and remember to bee-lieve in yourself! PLEASE NOTE: I paid for these stickers with my own money. This review is my own personal opionion on the product / company, given in good faith and has not be sponsored or endorsed. None of the links are affiliate links. Unless otherwise stated, all photography is my own. Being on the design team also means that you will also get exposure for your blog / social media and your artistic talent! Everything that you do with your goodies I will also share and you will also have ‘presence’ on my blog for the duration of your DT inclusion. The design team will run until 31st August 2017 and either party can resign / withdraw at any time without notice or reason, all I ask is that if I have sent you something you just finish up with that before you go. Share an ‘unboxing’ of what you received each month on your Blog / YouTube / Social Media Accounts etc. and what you did with the products. Create something(s) using the items that you have received and submit a blog post with photographs for inclusion on my blog: mrsbrimbles.blogspot.com once a month (timetable to be agreed with the final DT). With the same post (possible tailored to your audience) shared on your blog too and of course I will link back to you at all times. Closing Date for submitting your application is Sunday 25th September 2016. Please note that I will not get back to you confirming the decision until after 25th September – I will need time to think and read through them all. I may get back to you sooner but don’t panic if you don’t hear until after 25th. You will know I have received your application as you will receive an email auto reply. On application close, I will assess all of the applications together and then choose, which is most likely going to be very difficult! There is currently one spot open but who knows, I may choose more than one. Most likely Mr B will help me choose. Just to clarify I will be selecting based on your creativity and the best fit for the products that I sell and not on your Country or the fact you don’t have a YouTube channel etc so please do not let that deter you from applying.